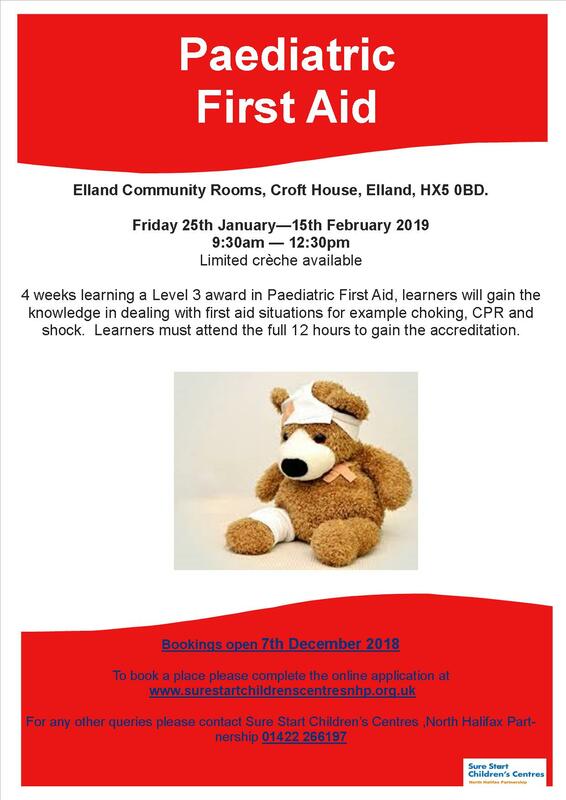 Sure Start Children’s Centres, North Halifax Partnership will be hosting an Accredited Paediatric First Aid Course at Elland Community Rooms, Croft House, Elland HX5 0BD starting on Friday 25 January, 9:30am-12:30pm. In the 4 week course you will learn a Level 3 award in Paediatric First Aid. Learners will gain the knowledge in dealing with first aid situations for example choking, CPR and shock. Learners must attend the full 12 hours to receive accreditation. To book go to the online booking form or call 01422 266179 for further information. This entry was posted in Elland, Feb, Get Involved / Have Your Say, Health, Jan and tagged Elland Children’s Centre, NHP Sure Start Children's Centres. 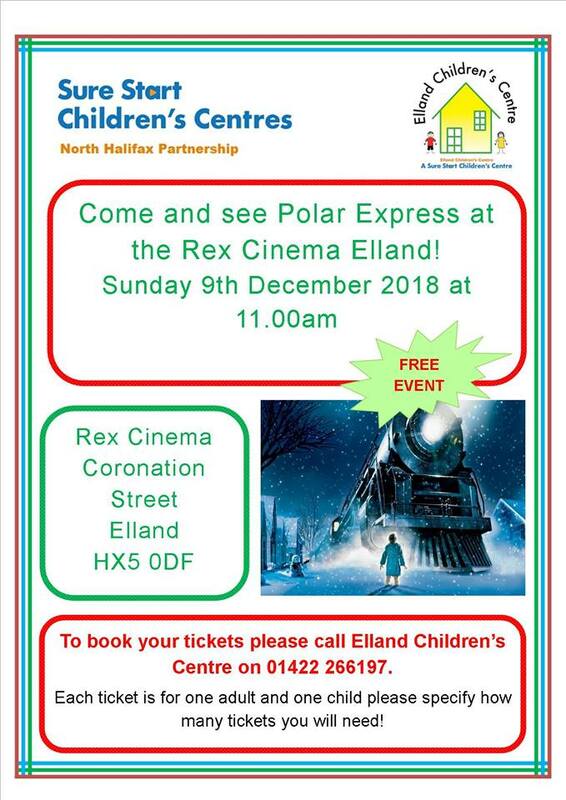 FREE Event – join Elland Children’s Centre at the Rex Cinema in Elland on Sunday 9 December, 11:00am to see Polar Express. Just call Elland Children’s Centre on 01422 266197 to book your free ticket for one adult and one child! This entry was posted in Get Involved / Have Your Say and tagged Elland Children’s Centre, Rex Cinema. 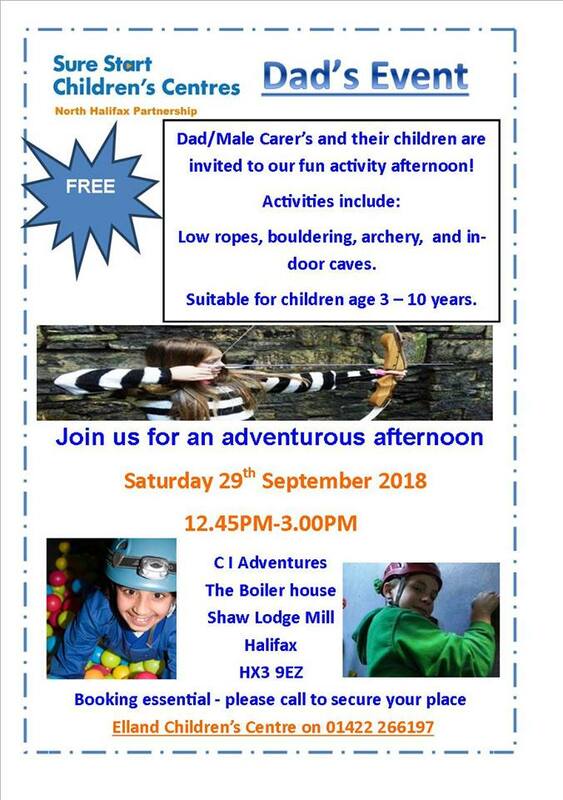 All dads, male carers and their children (3-10 years) are invited to join Elland Children’s Centre at C I Adventures, The Boiler House, Shaw Lodge Mills, Halifax HX3 9EZ on Saturday 29 September, 12:45pm-3:00pm for a FREE fun activity afternoon. Activities include low ropes, bouldering, archery and indoor caving. Booking is essential so please book your places by calling 01422 266197. 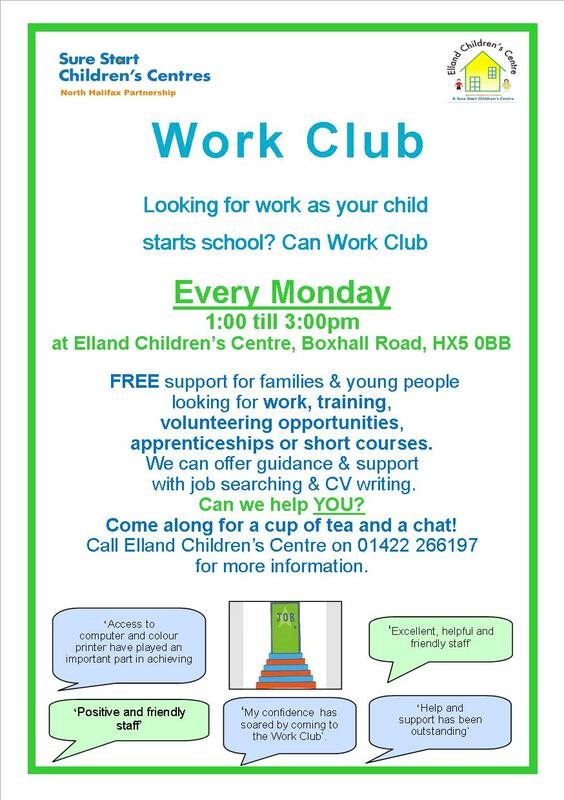 This entry was posted in Elland, Events, Get Involved / Have Your Say, Sep, Sure Start, Young People and tagged Elland Children’s Centre. 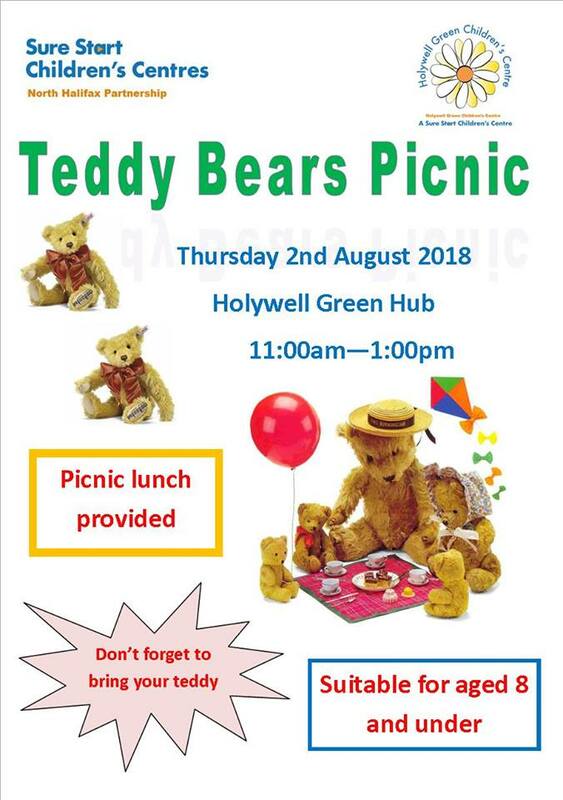 Join Elland Children’s Centre on Thursday 2 August, 11:00am-1:00pm for a Teddy Bears Picnic at Holywell Green Children’s Centre. Suitable for children 8 years or under, a picnic lunch is provided and there is no need to book your place just turn up on the day. This entry was posted in Aug, Elland, Events, Sure Start, Young People and tagged Elland Children’s Centre, Holywell Green Children’s Centre. On Monday 26 February, 12:30pm-2:00pm, Elland Children’s Centre, Boxhall Road HX5 0BB will be hosting a course on Money Management given by WYCAS (West Yorkshire Community Accounting Service). This FREE 4-week course is for people aged 19+ who want to understand ways to manage money and stay on top of bills. This entry was posted in Elland, Events, Feb, Sure Start and tagged Elland Children’s Centre, WYCAS. 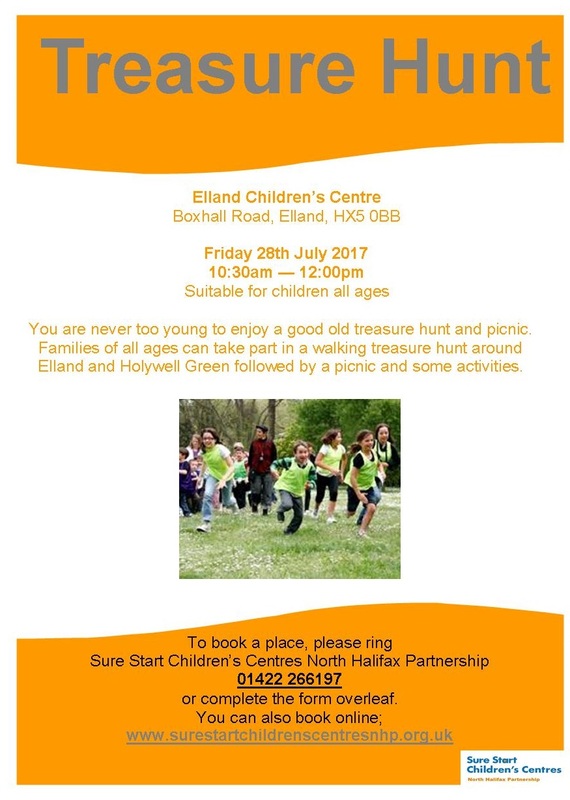 Meet at Elland Children’s Centre, Boxhall Road, Elland on Friday 28 July 2017 10:30am aiming to finish the walk at 12:00pm. This entry was posted in Elland, Events, Get Involved / Have Your Say, Greetland & Stainland, July, Young People and tagged Elland Children’s Centre, Get Involved. Make Mother’s Day memories and have your family photos taken with a Tempest Photography photo shoot as well as arts & crafts activities with snacks provided. Each photo shoot will last no longer than 10 minutes. 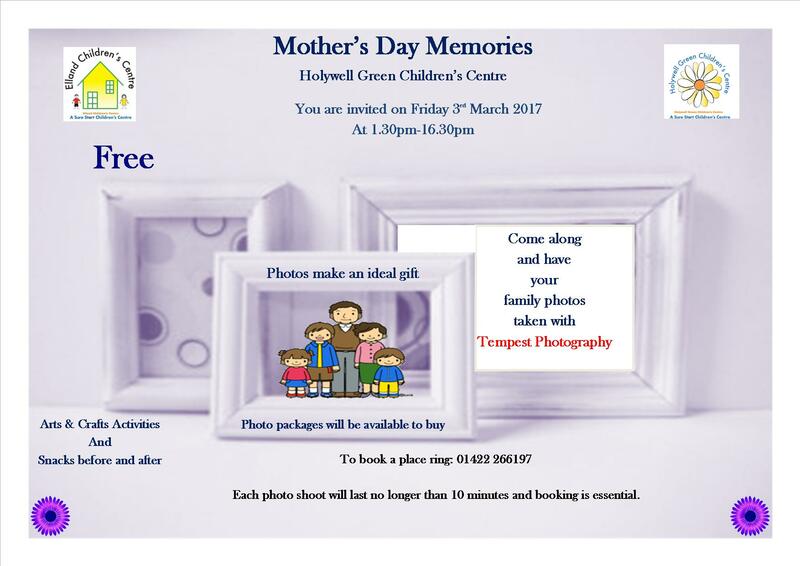 This entry was posted in Elland, Get Involved / Have Your Say, Mar and tagged Elland Children’s Centre, Event, Family Activity, Get Involved, March, Mothers Day, Photo shoot, Sure Start. Being pregnant (especially for the first time) can be extremely exciting and a very happy time as you prepare for your new arrival. However, it can also feel daunting at times and a little overwhelming as you realise the idea of bringing your child home for the first time. Surestart and the Lower Valley Health Visitors team want to help you feel confident and reassured about those first few days and weeks after your baby has arrived. So if you are 30 weeks+ then come along to our antenatal workshop and meet your new health visitor on the following dates! This entry was posted in Brighouse, Elland, Feb, Get Involved / Have Your Say, Jan, Mar, Rastrick and tagged Elland, Elland Children’s Centre, February, Field Lane Children’s Centre, January, Lower Valley, March, NHP Sure Start Children's Centres, Rastrick, Wellholme Park Children's Centre, Workshop. A 4 week adult only cooking course, teaching the basics and how to get the best out of your shopping budget. Participants will be cooking seasonal food with autumn and Halloween themes. This entry was posted in Elland, Get Involved / Have Your Say, Sep and tagged Cooking, Cooking Course, Elland, Elland Children’s Centre, Get Involved, Halloween, NHP Sure Start Children's Centres, September.